In response to scientific needs for more diverse and structured explanations of statistical data, researchers have discovered how to model individual data points as belonging to multiple groups. 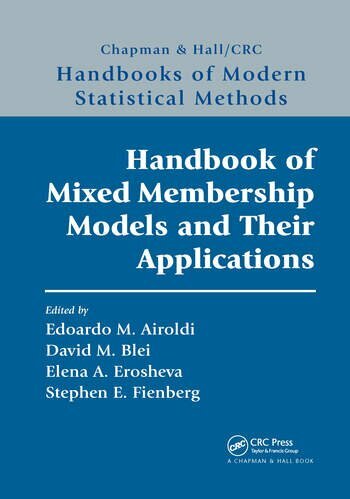 Handbook of Mixed Membership Models and Their Applications shows you how to use these flexible modeling tools to uncover hidden patterns in modern high-dimensional multivariate data. It explores the use of the models in various application settings, including survey data, population genetics, text analysis, image processing and annotation, and molecular biology. The handbook spans more than 20 years of the editors’ and contributors’ statistical work in the field. Top researchers compare partial and mixed membership models, explain how to interpret mixed membership, delve into factor analysis, and describe nonparametric mixed membership models. They also present extensions of the mixed membership model for text analysis, sequence and rank data, and network data as well as semi-supervised mixed membership models. Edoardo M. Airoldi is an associate professor of statistics at Harvard University. Dr. Airoldi’s current research focuses on statistical theory and methods for designing and analyzing experiments in the presence of network interference as well as on modeling and inferential issues when dealing with network data. David M. Blei is a professor of statistics and computer science at Columbia University. Dr. Blei’s research is in statistical machine learning involving probabilistic topic models, Bayesian nonparametric methods, and approximate posterior inference. Elena A. Erosheva is an associate professor of statistics and social work at the University of Washington, where she is a core member of the Center for Statistics and the Social Sciences. Dr. Erosheva’s research focuses on the development and application of modern statistical methods to address important issues in the social, medical, and health sciences. Stephen E. Fienberg is the Maurice Falk University Professor of Statistics and Social Science at Carnegie Mellon University, where he is co-director of the Living Analytics Research Centre and a member of the Department of Statistics, the Machine Learning Department, the Heinz College, and Cylab. Dr. Fienberg’s research includes the development of statistical methods for categorical data analysis and network data analysis. "The editors of this volume have notably worked at the forefront of research in various subfields of mixed membershi modeling since the field’s inception. . . . The strength of their collaboration in editing this volume can be seen in the book’s organization. . . .One of the main strengths of the book, fulfilling the promise of its title, is the wealth of applications described therein . . . We believe this book sets the stage for a rich body of future work."